However, it's also a great way to drive traffic to your site. That's according to a new HubSpot e-book: "How to Use Pinterest for Business". - In October, the website of Time Inc.’s real Simple magazine got more traffic from Pinterest than Facebook. 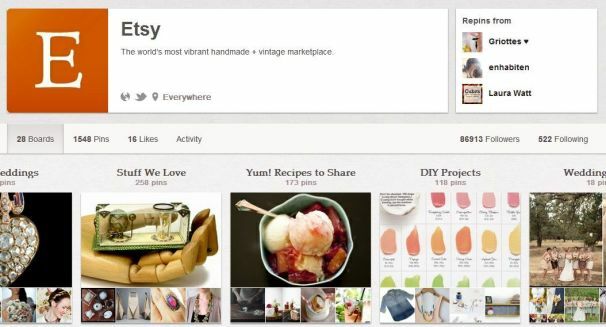 - In February, 2012, Pinterest has been driving more referrals to HubSpot’s blog than Google+. This insight proves that Pinterest presents a serious challenge to other social media channels and offers a competitive advantage to businesses that have started leveraging its potential. - Infographics are all the rage right now, and they are doing very well on Pinterest. If you have any industry data that you can visualize, do so before someone beats you to it. HubSpot also recommends holding contests, adding the Pin It button to your Web site, and letting other users contribute their own pins to your pinboard -- especially if their content includes your product. In short, there's a lot of good material here, all of it neatly and attractively presented. The only price you pay for this freebie is a bit of personal information: name, e-mail address, and a few details about your company. Seems like a fair trade to me. Of course, you'll also find plenty of helpful resources right here, including What You Should Know About Pinterest and Copyright and Pinterest Under Siege By Scammers. If you've had any experience using Pinterest to boost your business, tell us what works -- and what doesn't -- in the comments.